Here's what history shows about how personal defense companies perform depending on whether there's a Republican or a Democrat in the Oval Office. Although 2016 might not be shaping up as the best year for personal defense stocks, it hasn't been a bad one by any means. Shares of companies like Taser International (NASDAQ:AAXN) are up 28% year to date, even after it gave back nearly a quarter of its recent gains, and Smith & Wesson Holding (NASDAQ:AOBC) stock is running over 20% higher than where it started the year. But defense stocks have long seemed to be sensitive to political forces. As a case in point, gun owners have worried that President Barack Obama would promote legislation that would restrict the rights of people to lawfully own firearms. In the run up to his first election, those fears did seem to play a role in gun sales; FBI background checks of potential gun buyers spiked in the months before his inauguration. Naturally, as President Obama's administration comes to an end, gun owners and investors alike are wondering -- what will the the outcome of the 2016 election signal for these companies? Both Clinton and Trump have laid out their agenda on guns and given voters a fairly stark contrast in their approach. Clinton favors broader background checks into gun buyers, closing loopholes, and perhaps most controversially, holding gun manufacturers responsible for crimes committed with their weapons. While Trump advocates enforcing existing laws before enacting new ones, revamping the country's mental health system, and protecting gun owner rights to buy ammunition and magazines of their choice. With a vacancy on the Supreme Court to be filled, however, the election winner may have more influence with their judicial appointee than any policy measures they plan to enact. Looking back at how defense companies have performed with each party in power, the picture isn't entirely clear. Sturm Ruger's (NYSE:RGR) history as a publicly traded stock goes back to 1969, so it's been through a few administrations of both parties, and while its stock gained some 67% (excluding the value of dividends) under the 41st president, George H.W. Bush, it lost 42% under his son, George W. Bush, the 43rd president. A better bet may be to look at changes in the market cap of companies, which over time can smooth out the vagaries of stocks splits, share repurchases and the like. 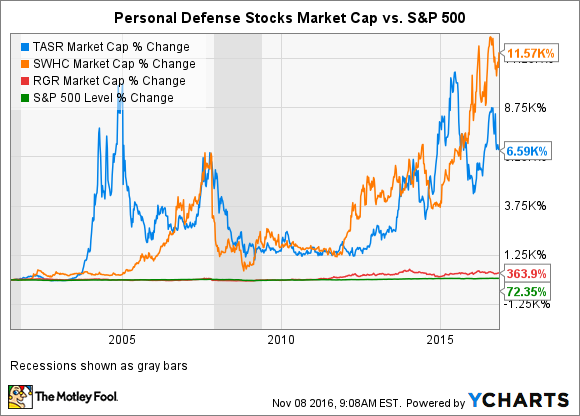 Doing so, we see over the last seven-plus years personal defense stocks performing quite well compared to the market as a whole. Even Taser, which sells more into professional markets than to consumers, handily outpaced the S&P 500. Breaking out the changes in market cap with the individual administrations gives a clearer picture of the situation. Ruger, with the longest history, has done well (and poorly) under both Democrats and Republicans. Smith & Wesson has certainly done well during President Obama's years in office, but it had performed well under George W. Bush too, until the broader financial market collapsed. In fact, it's easy to forget Obama was elected to office in the middle of a recession when stock values were severely depressed. His rhetoric and policies certainly played a role in the gun sales boom we've seen, but the performance of these companies may have been amplified simply by having been beaten so far down by the financial crisis. President Obama's time in office has certainly been a strong one for all personal defense stocks, whether stun gun manufacturers or firearms makers, but it's not so clear-cut to say he necessarily deserves the nickname of "the greatest gun salesman in history." Further, investors shouldn't expect certain results from defense stocks based solely on the outcome of the election. Many factors have come into play over the years, though presidential policies can determine the course of an industry. Yet as we've seen looking back over periods longer than just one administration, wide swings in value have occurred regardless of which political party is in office. It might just mean that no matter whether Clinton or Trump wins the election, the outcome might not be as influential on this industry as one would think.